We need cables and wires for electric appliances. The more electric appliances we use, the more cables and wires will spread in our surroundings. Considering the utility of these appliances, it is totally impossible to do away with any of them. But you need to organize them to prevent tripping and falling.Besides, a room with spread-out wires and cables give a disorderly impression and puts you in wrong light among your friends and acquaintances. As our experience, here are several tips about how to organize your cables and wires, to make your cables and wires safer and more beautiful. Never separate different cables and wires. 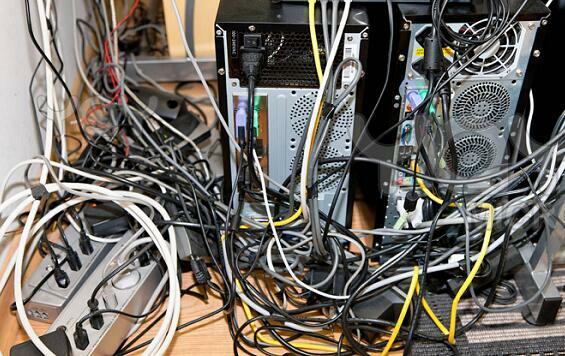 Once you have fixed the wires to the electric appliances, tie the remaining cables and wires and tie them together. As far as possible keep the appliances close to wall so that the overhanging wires and cables are not distinctly visible outside. Cable tie is the cheapest and easiest one to hold any of cables and wires. The wires and cables that are spreading out can be made to run along the base boards. You can use an industrial stapler to hold the wires together. Wire loom is widely used to protect wires and cables, split wire loom turning manage cables and wires easily. It is simple, you need to push your cables and wires into the open split and then you will find them absolutely intact. The best thing about split wire loom is that every time you want to add a new wire, you need not remove the whole bundle. Instead you just need to slip the wire into the split where it will get fit perfectly. Cable clamp is another highly recommended cable wire organizer. The clamp can be opened and closed easily with one hand and can conveniently hold a larger bundle of cables/wires. In comparison to cable ties, tape and hook & look items, clamp is more functional and easy to use. Another advantage of using the clamp is it can be used for any number of times. Besides, it exhibits self-locking and self-adjusting features as well. You can easily get over the mess of cable chords by bringing in a cable tie. Available in white and black color to match any home, the cable zipper easily contains a number of wires. It has two open ends – one for the wires to enter and the other for the wires to exit so that these can be fixed to the switch on the wall. It neatly arranges the wires into one-fold and lends an aesthetic touch to your home.